It’s been a crazy couple of days when it comes to live-action anime remakes. First, rumors of Taika Waititi (Thor: Ragnarok) directing Akira (which is moving forward) erupted, followed yesterday morning by news that John Cho has been cast as Spike Spiegel for the Netflix live-action adaptation of Cowboy Bebop, along with casting for Jet, Faye, and Vicious. That second item really caught the eye of both @mdrmn (Newman’s Nook) and myself, as we’re both super fans of Cowboy Bebop and admirers of John Cho—though our reactions to the casting news were very different. Matthew, I’ll let you go first—what do you think of the news? My first instinct when I heard the news was absolutely positive! I love Cho’s work both as an action star in the Star Trek franchise and his comedy chops in the Harold and Kumar series of films and Selfie. I feel he has shown a range and ability to play different characters which, together, would blend well to make a solid Spike. I’m a little less enthused. Actually, I’m quite upset about it, and here’s why: There’s nothing in Cho’s repertoire that makes me think he can pull off Spike, including those properties you’ve mentioned. Selfie is a favorite of mine, as is another series he starred in, Flashforward, and I think those series showcase the type of character he’s just right for: the responsible guy. The guy you want having your back. The friend who is perhaps underestimated, but who shows his mettle in the end (in other words, a strong representation of the model minority type—but that’s a conversation for another time). I can understand the sentiment, because few roles are really like Spike so we haven’t seen Cho in any role that’s similar. Spike is such a unique character with both swagger, cleverness, and…some physical awkwardness. In some ways, Spike comes across like John Krasinski as Jim Halpert on The Office, long and gangly and not the person you expect to suddenly bust out fighting moves. Until he does. Cho fills that role well as he has the sarcasm, humor, and action chops to pull it off. He does sarcasm very well, I’ll give you that, but the action part? See, I think that’s where you get it wrong. Is Spike awkward? Yeah but in the loosest of ways—Spike is a cool cat. Cho is not. Cho is your buddy. He’s your friend-zoned dude. He’s your “get it done” man. There’s something predictable and structured about his mannerisms and acting, not just in the roles he plays. Spike is unpredictable and smooth—Cho doesn’t exhibit those qualities. Take Star Trek—the fight scene above is good and it perfectly fits in with Cho’s MO—and cool is not it. Also, the physicality! Spike makes martial arts look more fluid than it really is. It’s a huge part of the appeal for his character. I don’t know if Cho can pull that off (even if the directing is just right), nor is there a believably to him to become that bad dude that can just kill everyone (though I do like your example of Krasinski, having watched season one of Jack Ryan). Also, too short! Spike looks taller than his 6’1”. Cho looks smaller than his 5’10”. And that lankiness and height is an important part of the Spike character. I disagree about Cho being cool. While he is often the straight man in a comedy duo, he can pull off cool. There are moments in Selfie where he is absolutely cool and in his short-lived role on How I Met Your Mother as the evil business executive, Cho played a character who exuded confidence as the epitome of smooth, cool. And while he may not have the body type, is that really the end of the world? Who would have watched Parks and Recreation and thought to themselves that the pudgy, goofy actor who played Andy Dwyer (Chris Pratt) would be a perfect actor for roles in Guardians of the Galaxy as the ripped Star Lord; and yet, it works! Well, Pratt had to work that body into shape to be Star Lord! We’ll have to wait and see if Cho will do something similar. Anyway, I do hope you’re right. As meaningful as Cowboy Bebop is to me, I am both very open to this adaptation and willing to forgive if it goes awry. Plus, I’m really happy to see a Korean-American like myself get such a prominent, cool role. And Cho is my wife’s maiden name by the way! So I’m pulling for the guy, even if I don’t think the casting will work. While the Cowboy Bebop TV series continues in pre-production, why not check out the original classic, which made a Final Four run in our March Madness tournament this year? While you’re at, check out Akira as well—it is 2019 after all! The featured art is by オーバーワーク (reprinted w/permission). I would hesitate in typecasting Cho. If he’s a solid professional actor and has watched Cowboy Bebop at least one time through, he should be able to replicate the style. I think the height’s probably about normal as long as they don’t cast most of the other cast as bigger than him besides Jet. As a fan who owns the entire series of Bebop, I think they could do much worse, but they have to dress him the same way and modernize the hair. That hair will not look good in a live action movie. 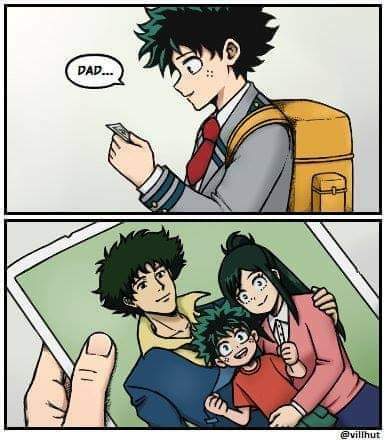 He’ll end up looking like an adult Deku from My Hero Academia. I think so much of the anime is lost for modern audiences because it’s structured in all sorts of ways in 80s and 90s pop culture. Yeah, but watch it with your parents because it can be graphic at times. I should start watching it with my dad and my brother again. It might be a good time to! Hmm… I can’t say on the acting front since Spike is an unusual role, so I don’t expect a character like him to be reflected in the chosen actor’s previous work. Sean Connery might be the only actor I can think of that had a role even partially similar to Spike (from way back when he was Bond). I’d like to hope that they did some readings and auditions and this actor came out on top. On appearance I’ll admit I am disappointed. Spike was based on the appearance of Yusaku Matsuda, and Cho does not have that look at all. Spike is very lanky, meaning he’s tall but also that he’s tall because he’s got long legs. Long legs and long arms, that build that sort of looks awkward until suddenly he moves smoothly in combat. But trying to find someone who has the appearance, and the martial arts ability, and the acting chops… that’s a hard thing to do. I’d have to say that the appearance is the least important to me, so I’m not going to going to complain too much if the acting is good. Of course, I have low expectations anyway because of the failures of adaptations but we will see. If there is any anime that ought to be able to be adapted easily into a western medium it is Cowboy Bebop. So maybe I’ll be surprised. Just to be clear, I feel that the other Bonds don’t have the same feel that Sean Connery’s did. Connery’s Bond had that easy self confidence mixed with just a little silliness and self awareness of the ridiculousness of life, and then suddenly the action starts and he smoothly becomes serious, but still without losing the humor. I hadn’t though so far as to who I would cast, but since you brought it up, I agree—Connery’s Bond does have some of that same, confident but also humorous swagger to him. I loved the original series – so I definitely recommend it. But it’s not for kids. Cicero – I am of the mindset that Cho is up to the task. Sure, he doesn’t look like Matsuda, but so what? You make the Bond comparison and I think that’s apt – as every Bond is valid and each Bond has a distinct, huge fan base. It doesn’t make any of the actors any less Bond when they were in that role. To be honest, I saw Spike as a Bruce Lee kind of person, but with blues suave and gun slinger accuracy. If I’m correct, Spike’s fighting style does take inspiration from Bruce Lee. I am surprised it’s not gonna be Keanu Reeves. I’ve never really watched anything that had John Cho in it, so I would give it a try! I just REALLY hope they don’t mess this up, because live action anime adaptations have never been the greatest. At all……. I will say- The casting choice for Jet was interesting. This might be the first live adapt I’ll give a go! Maybe rewatch Bebop and see the movie finally. Keanu has optioned the movie years ago, and I would have liked to see him as Spike, but he eventually said it died because his vision of the movie he wanted to create was too expensive to get green lit!